Amazonia is home to powerful states and complex societies. The complex societies of Amazonia have vanished. The region around Rio de Janeiro has become the main centre of Brazilian economy and society. 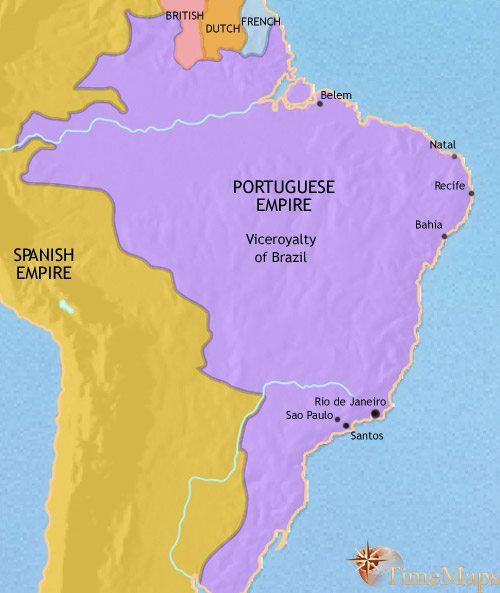 Brazil is now independent from Portugal under a branch of the Portuguese royal family. 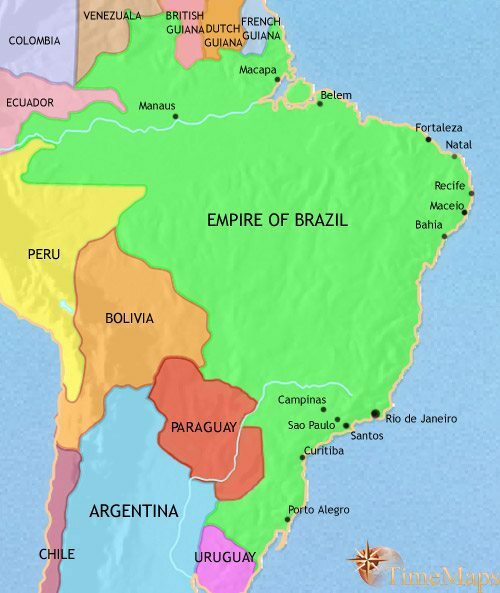 Under Emperor Pedro II, Brazil's economy has greatly expanded. In Brazil, the empire has been replaced by a republic. Brazil has experienced economic and social progress. The towns, cities and states of Amazonia and its border regions are home to complex societies. They have developed sophisticated technologies and elaborate built environments, characterized by complexes of earthen mounds and enclosures. 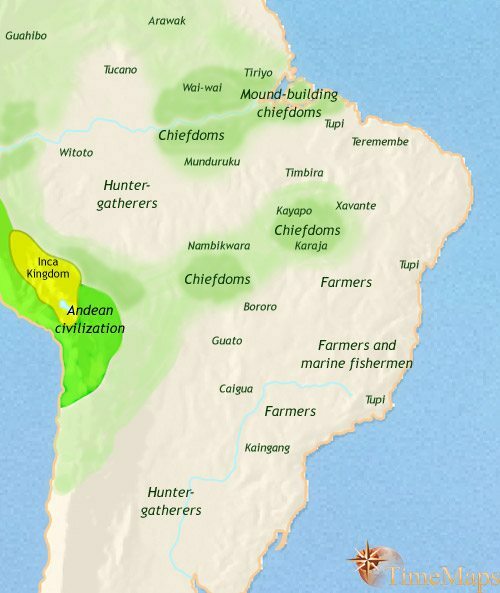 The most spectacular examples of Amazonian civilization are located in the central floodplains of the Amazon and its main tributaries, but major states can also be found on the southern fringes of the Amazon basin, in what are now south-western Brazil and Bolivia. Here, powerful, multi-ethnic chiefdoms, originally founded by Arawak-speaking groups, have over time nurtured hybrid regional cultures. Massive and extensive earthworks, plazas, roads, and moats are integrated into a grid-like pattern across the landscape, testifying to well-organized, hierarchically-based state systems. 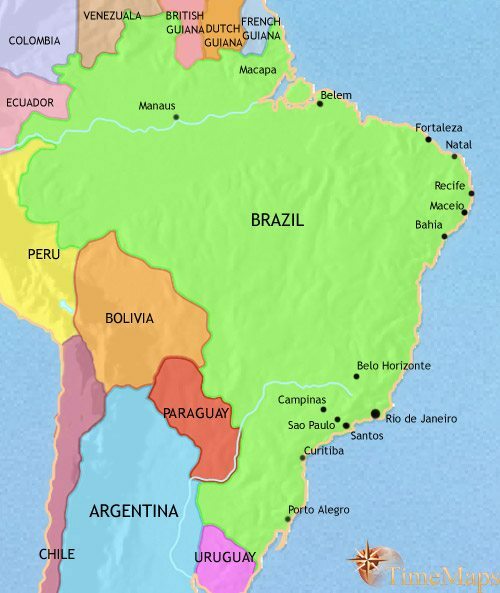 The Portuguese explorer Pedro Alvares Cabral had touched the east coast of South America on his way to India (1500). He had claimed the country for Portugal, and several Portuguese expeditions were then dispatched to explore the region. The Portuguese, however, more interested in the East, neglected their American claims. 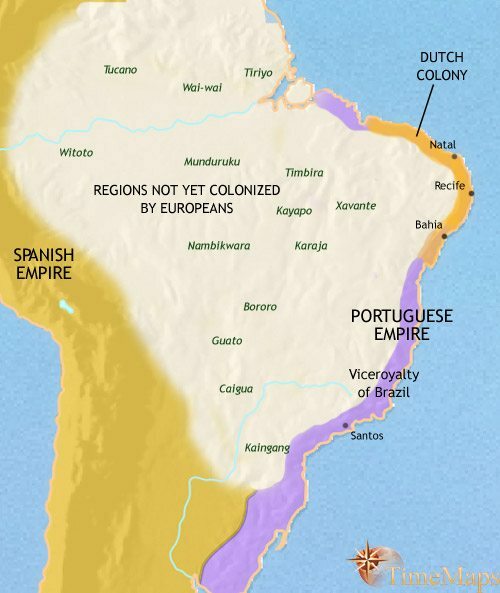 The colonization of eastern South America was undertaken by leaders who established semi-independent fiefdoms, called “captaincies”, under only loose control of the Portuguese government. This neglect let other Europeans, notably the Dutch, establish their own colonies in the area. However, with the rise of the sugar trade, the Portuguese have renewed their interest and by now have all but cleared the other Europeans from the country. The dearth of Indian labour has led to black labourers being forcibly imported into Brazil from Africa as slaves. Here they form the mainstay of a plantation economy, producing tropical crops – chiefly sugar – for the European market. The first Europeans to travel along the river Amazon reported seeing many large towns and villages, housing a large population. When Europeans visited the region again, however, all this had vanished, almost certainly carried away by European germs. To the south, the region of present-day Sao Paulo has become the centre for poor cattle-rearing settlers. Unable to afford African slaves, and with Indian labour in the vicinity scarce, they have organized raiding parties called “Bandeirantes”, which penetrate ever-deeper into the interior in search of slaves. Interbreeding between the races produced a rough and energetic frontier society along this southern coast. Brazil’s sugar exports, once the mainstay of her economy, have been loosing ground to those of the British and French Caribbean, but coffee-growing is becoming more important. This is centred on plantations on the southern coast. The bandeirantes based in the Sao Paulo area have continued their slave raiding activities, travelling further and further into the interior. In so doing they have explored western Brazil, and effectively opened up much of the interior to settlement. Their activities have pushed out the boundaries of Brazil far to the west of the line originally agreed between Spain and Portugal in the Treaty of Tordesillas, in 1494. In the south, slave raiding has increasingly given way to gold prospecting, especially in the region of Minas Gerais; and to diamond mining. These activities, together with coffee-growing, have turned the south of the country into the wealthiest part, with Rio de Janeiro as Brazil’s chief city and seat of government. In the grasslands of the interior cattle ranches are beginning to be established. Independence has come to Brazil in a very different way to any other country in the New World. The Brazilians on the whole remained loyal to the Portuguese crown, with its mild (not to say ineffective) rule. The Portuguese royal family, however, was forced to flee from their homeland when Napoleon invaded Portugal in 1807. Evacuated from Lisbon by the British navy, the king and his court took up residence in the Portuguese empire of Brazil. They quickly grew to feel more comfortable here than in Portugal itself. The presence of the royal family has led to the establishment of proper government throughout much of Brazil, including the founding of a postal service – an important step in so large a country. The king only returned to his homeland in 1821, but left his son, Pedro, to rule in Brazil. 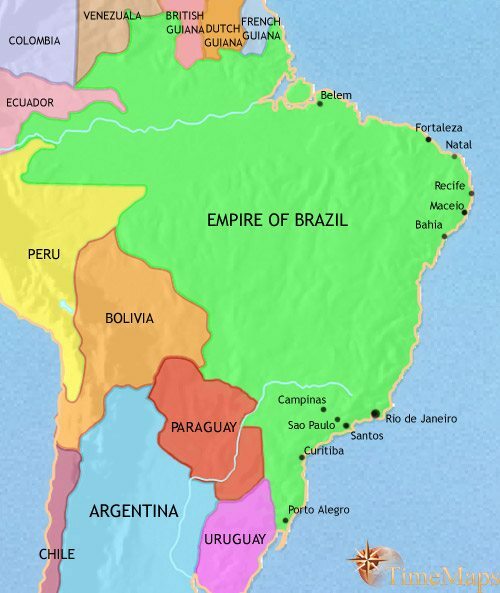 The following year Pedro declared Brazil an independent empire, with himself as emperor. His autocratic rule cost him much popularity, however, and he suddenly abdicated in 1831, leaving his five year-old son, Pedro II, on the throne. Emperor Pedro II has ruled Brazil for the past 40 years, since the age of five when his father suddenly abdicated the throne (1831). Under Pedro, the country has known political stability. The economy has greatly expanded, and thousands of miles of railroad laid down. In the political sphere, democratic institutions, such as a free press and parliamentary government, have developed, albeit under royal control. The late nineteenth century was a period of strong economic expansion, as Brazil found itself drawn more and more into world markets and received massive investment from Europe and, later, the USA. The most notable aspect of this expansion was the rubber boom, centred on the city of Manaus, deep in the Amazon jungle. This boom came to an abrupt end with the smuggling of rubber plants to Malaysia and the consequent ending of Brazil’s monopoly in rubber cultivation. The economic expansion led to the rise of a new middle class, which did not support the monarchical system of government of the emperor, Pedro II. Moreover, the abolition of slavery in 1888 was fiercely opposed by the plantation owners, and lost Pedro their support. He therefore abdicated the following year, 1889, leaving as a legacy a country that had a far higher level of economic and political stability then most South American states of the period. Brazil became a federal republic in 1891, adopting a constitution modelled on that of the United States. Government is in the hands of politicians who represent a narrow group of rural landowners, who are nevertheless intent of modernizing the country. A revolution brought Getulio Vargas to power as dictator (1930). His dictatorship was comparatively tolerant of the people’s freedoms, and he presided over a period of economic recovery, despite the sharp economic downturn of the early 1930s. Brazil developed a larger home-grown industrial base than ever before. After democracy was restored in 1946, Vargas was elected President by free vote (1951). His chaotic handling of government, however, led to his second abdication in 1954. The President is now (1960) Juscelino Kubitschek, whose regime has pursued modernizing economic policies. This year sees the dramatic opening of Brazil’s brand new capital, Brazilia. In 1964 the military took power, on the grounds of the mishandling of the economy by the civilian politicians. This ushered in two decades of fairly tolerant military rule, ending in a return to civilian government in 1985. Since that time Brazil has been run along democratic lines, despite periods of hyper-inflation and economic crisis, which Brazil brought under control under the presidency of President Henrique Cardoso (served 1995-2002). Nevertheless, Brazil remained an extremely unequal society, and this helped bring the socialist Lula de Silva to the presidency in 2002. Under de Silva, a combination of shrewd economic policies and some of the most effective anti-poverty measures in the world have made Brazilian society more prosperous and more equal.